A major unanswered question for this Congress was how House Democrats would handle the U.S./Mexico/Canada Agreement (USMCA), the successor to NAFTA. Trade was not a meaningful topic in the midterm elections, clouding the positions of new members. You could imagine Republicans, centrist Democrats, and freshmen with unknown views coming together to pass one of Trump’s bigger geopolitical accomplishments. Those hopes are D-E-A-D dead. Democrats appear bitterly opposed to USMCA, citing protections for Big Pharma and unenforceable labor standards. The Trump administration is running out of time to make the necessary changes for passage, before elections in Canada and the U.S. shut down the process. And perhaps most important, one major USMCA measure that could actually entice liberals has moved to a separate venue for reform, reducing hopes for a salvage operation. USMCA bears many resemblances to NAFTA, which has been cited as a driver of low-wage corporate outsourcing. But Trump and U.S. trade representative Robert Lighthizer, one of Trump’s better appointees, have wooed labor-friendly Democrats by selling the deal as an improvement to worker fortunes throughout the continent. Under USMCA, more of a car’s value would have to be produced in North America, and close to half of that value would have to be made by workers earning at least $16/hour. Mexican “protection unions,” set up before anyone is hired to lock in low wages, would be effectively banned, and Mexican workers would have access to secret-ballot union elections for bargaining and contracts. These measures would improve Mexican labor standards, boosting the chances for U.S. and Canadian workers to compete. But labor, which seemed to want to “get to yes” on USMCA to rebut a caricature of being anti-trade, has long believed that these standards have no reliable enforcement, and that their recommendations for adding verification and explicit language were ignored. Last week, Owen Herrnstadt, chief of staff for the Machinists’ union, gave the definitive answer on this. Herrnstadt noted that, under USMCA, Mexico could simply vow to match the principles of labor rights, not the rights themselves, and still comply. “Few companies would be satisfied with such vague obligations when it comes to matters of special relevance to their interests,” Herrnstadt writes. In addition, fields not involving trade or investment don’t have to abide by the labor principles, creating an un-level playing field. There is no funding for enforcement, or even an adequate monitoring mechanism. Workers cannot get violators sanctioned on their own. It’s not even clear whether the murder of a trade union activist would qualify as a USMCA violation, since violations must occur “periodically and repeatedly.” Isolated incidents like killing a unionist doesn’t appear to meet that burden. Though industry heavyweights assembled a who’s-who of former Democratic lawmakers to lobby for USMCA—from Obama Commerce Secretary Gary Locke to vanquished Senator Heidi Heitkamp to Alexandra Ocasio-Cortez’s primary victim Joe Crowley—Democrats have largely sided with labor. Some have demanded actual changes to Mexican labor law before even considering the deal. House Speaker Nancy Pelosi told reporters last week, “We need to see enforcement. I’ve said it all along.” While the administration wants Congressional passage by this summer, Pelosi controls the timing, because Lighthizer won’t submit USMCA (and start a 90-day countdown to a vote) unless he thinks it can pass. Labor’s break with USMCA has given Democrats space to float other concerns. Labor’s break with USMCA has given Democrats space to float other concerns. For instance, high-cost biologic drugs enjoy ten years of data exclusivity in USMCA, which has raised Democratic ire because it threatens access to life-saving medicines for poorer Mexicans and Canadians. Enshrining protections into a trade agreement would also thwart efforts to reduce the 12-year biologic standard in U.S. law. An enhanced definition of biologics would undermine manufacturing of lower-priced generic drugs in several categories. The environmental standards also lack enforcement. Copyright terms are extended in USMCA, a gift to music and movie companies. And the digital chapter includes legal immunity for Internet companies that host illegal or pirated content. Scattered Republicans also have issues with USMCA. Some don’t like the wage conditions in auto production, others prefer to see steel and aluminum tariffs lifted before any vote, and Christian conservatives want LGBT protections taken out of the deal. Lighthizer’s stock answer has been that the U.S. can alter the implementing legislation, rather than re-opening negotiations. But liberals are adamant that the entire deal needs to be re-negotiated to win their support. Mexico and Canada are opposed to re-negotiation, making any resolution to the stalemate remote. Liberal Democrats may have felt pressure to support USMCA due to the investor-state dispute settlement (ISDS) provisions. 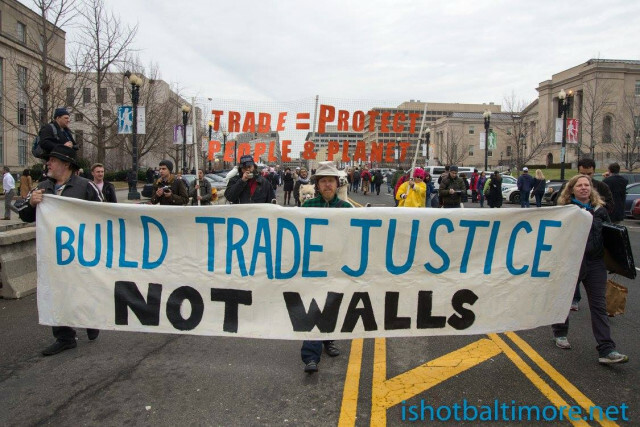 These are the extra-judicial super courts where corporations can sue countries for expected future profits if they change laws in ways construed as violating trade agreements.ISDS handcuffs national sovereignty and incentivizes outsourcing, by granting special benefits to foreign investors in low-wage countries. And, it has increasingly become a means for rich investors to speculate on lawsuits, winning huge awards and forcing local taxpayers to foot the bill. But in USMCA, the ISDS provision is virtually eliminated, save for some U.S. investors in Mexico with oil and gas contracts. Even there, domestic courts and administrative proceedings would have to be exhausted before ISDS could be invoked, several investor rights—like demanding a minimum standard of treatment from a foreign government—would be revoked, and only concrete damages could be demanded. Killing USMCA would sink this promising ISDS precedent. However, there’s a second option. The United Nations Commission on International Trade Law (UNCITRAL) is looking to reform ISDS for the first time since a failed effort in the 1990s. UNCITRAL is in the second stage of a three-stage process, and will determine whether reform is desirable by the end of this week. The UNCITRAL process is not without potential pitfalls. Europe in particular wants to assign a mild reform to ISDS as the new standard, merely installing a judicial board to address conflicts of interest from arbitration judges with financial incentives to rule for corporations. “There’s concern about legitimizing the system, creating this global constitutional court of investor protection,” said Lise Johnson of the Columbia Center on Sustainable Investment, a non-governmental observer to the UN process. The Columbia Center would rather see states given the ability to withdraw consent to arbitrate in ISDS tribunals, or even a termination of the 3,000 existing treaties with an ISDS provision. These are admittedly long-shots, but momentum is building, as evidenced by advanced countries like the U.S. and Canada agreeing to end ISDS in their own multilateral agreement. “The change in norms is important, especially for developing countries,” said Stiglitz, who believes even experienced trade negotiators would welcome a new model. If the UN process serves as the focus for ISDS reform, it won’t have to hinge on USMCA and all its troubles. That means the one provision that looked clean enough to provide a hook for Democratic support of Trump’s trade deal now could prove irrelevant. Liberals could win an end to trade agreements that lock in investor profits, and provide a lesson to Trumpian populists that you can’t just pay lip service to labor.